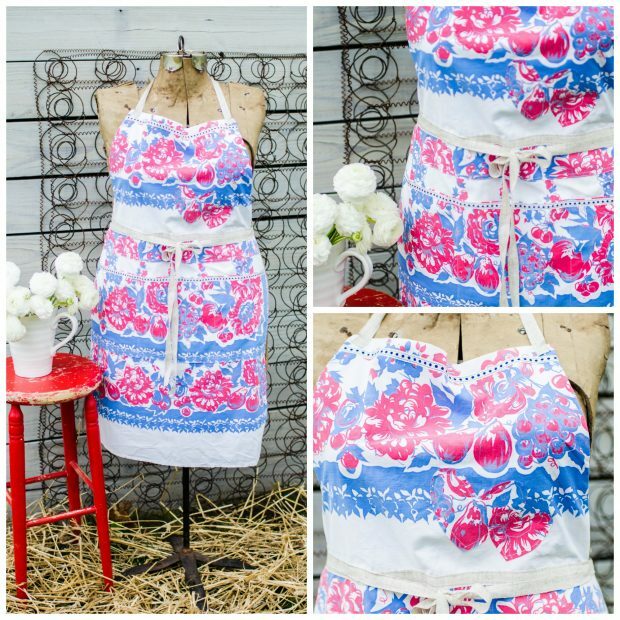 Years ago I created an apron pattern and shared it on the blog. 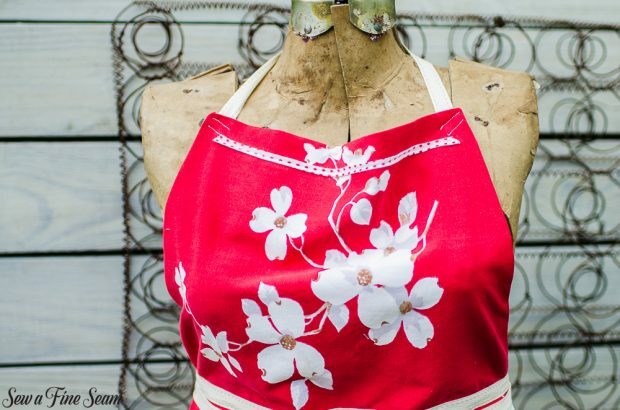 This year I decided to bring back that apron and add them to my line of handmade items. 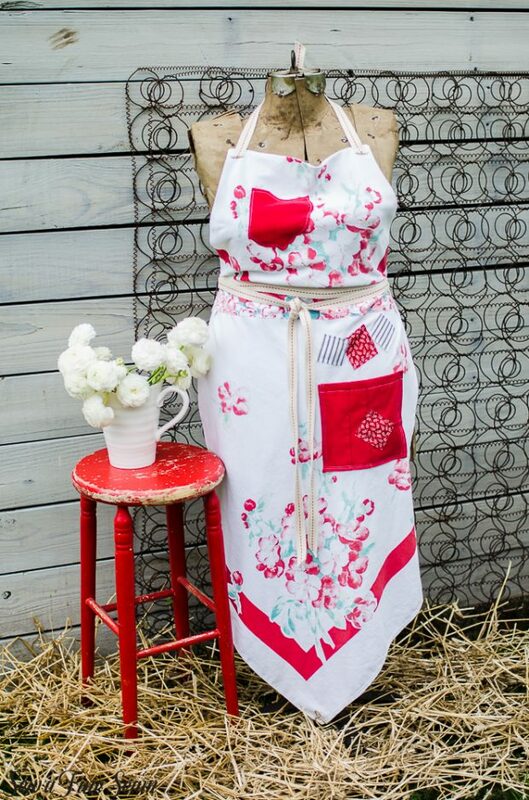 Made out of a vintage tablecloth, thus the name Vintage Tablecloth Apron, each one is unique and one-of-a-kind. 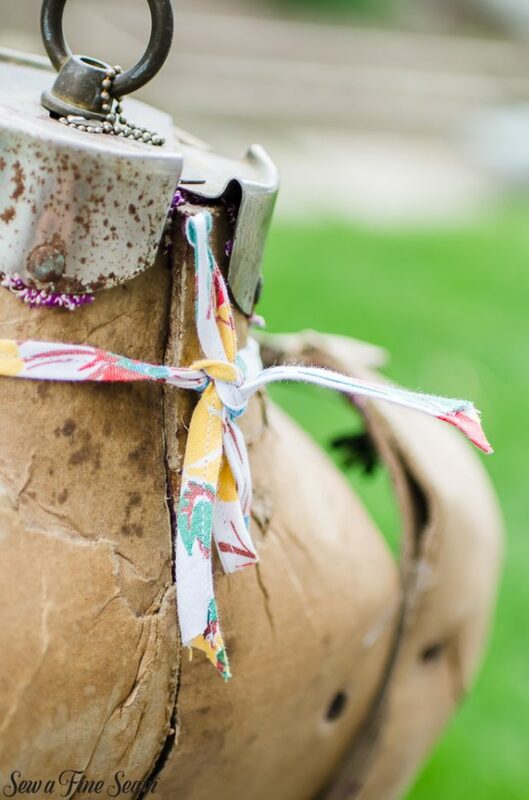 The top piece is lined to give it more substance and durability. The skirts of the aprons are trimmed out with either vintage trims or a cool, vintage-inspired dotted, embroidered binding. 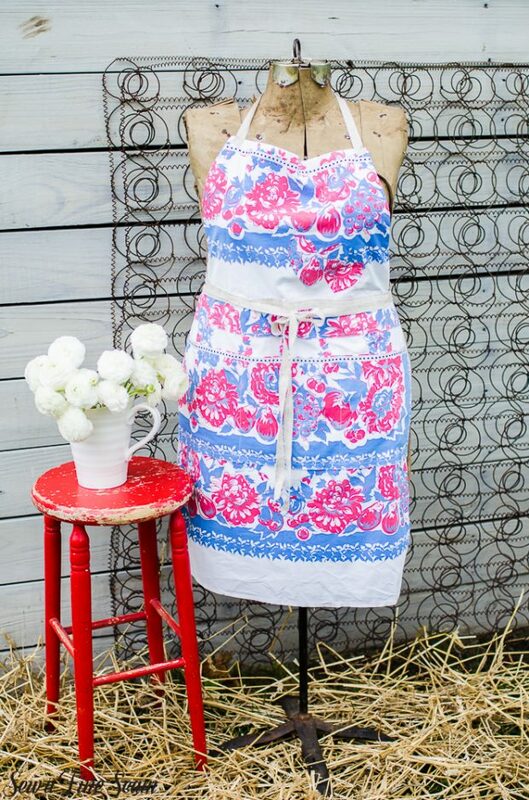 The strings of the aprons are long enough to wrap behind and then back around front and tie in front. The neck strings tie in the back so the sizing can be customized. 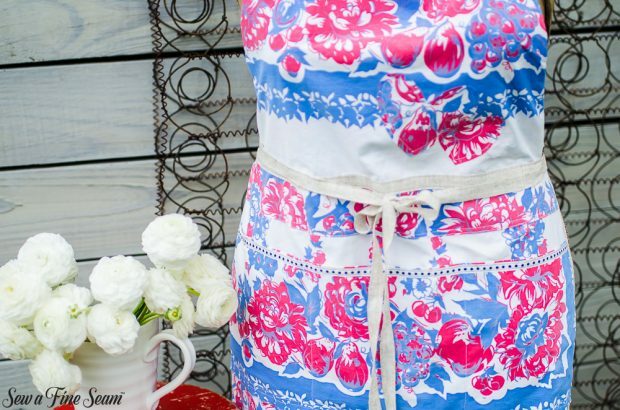 Some of the apron strings are made from a European, linen ribbon. 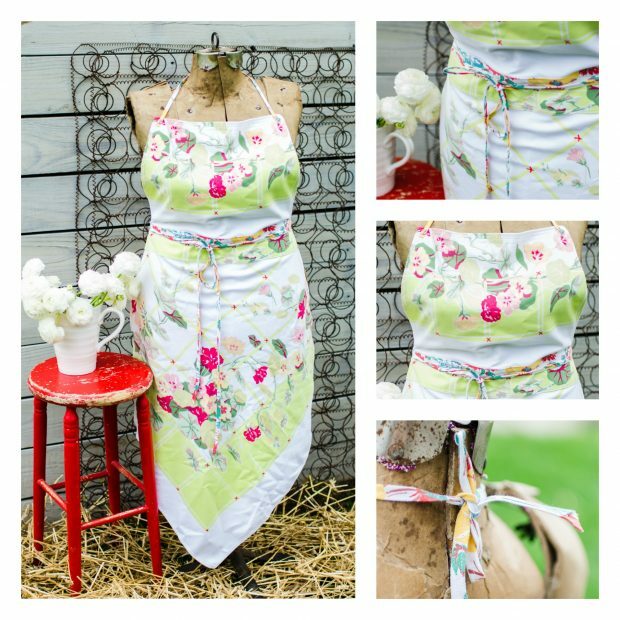 Others are vintage binding crafted into strings, or other ribbons that work well with the aprons. 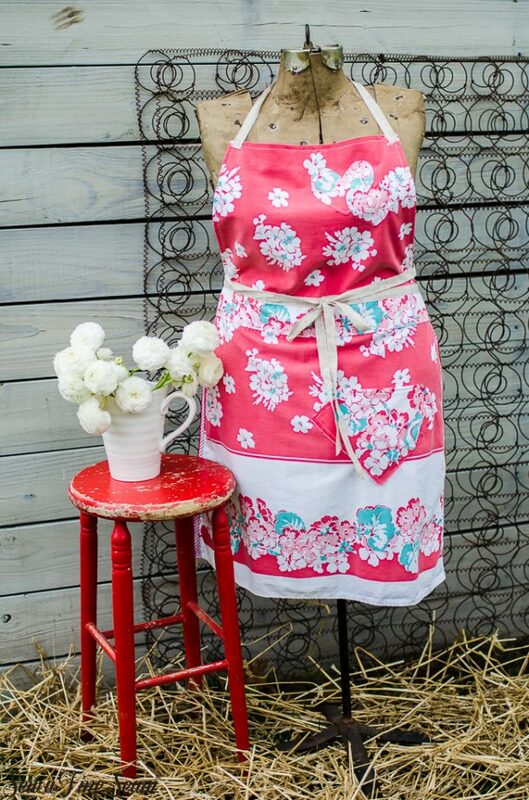 Many of the aprons have pockets added – placement of pockets is random -wherever they look cute when the apron is being created. This dotted, crotchet edged trim is a fav of mine! 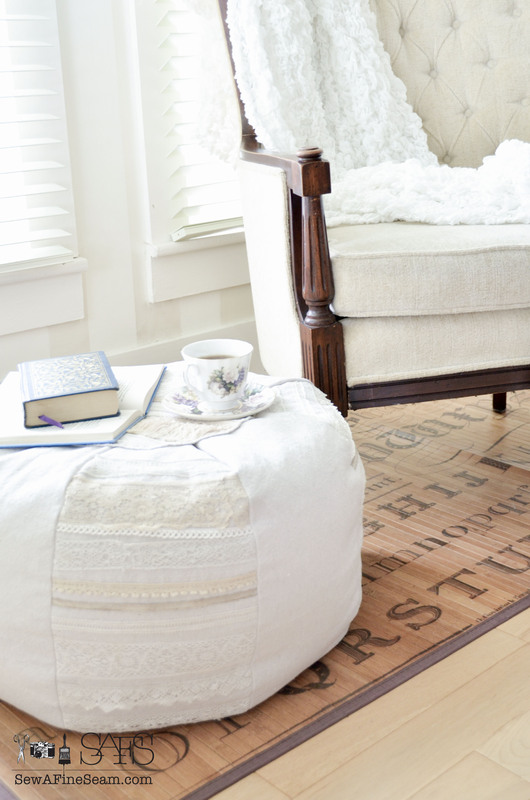 Heart details are added when needed to camouflage a small spot or worn place. These tablecloths are vintage so I concocted the hearts idea to make use of the tablecloths even when they weren’t in pristine condition. 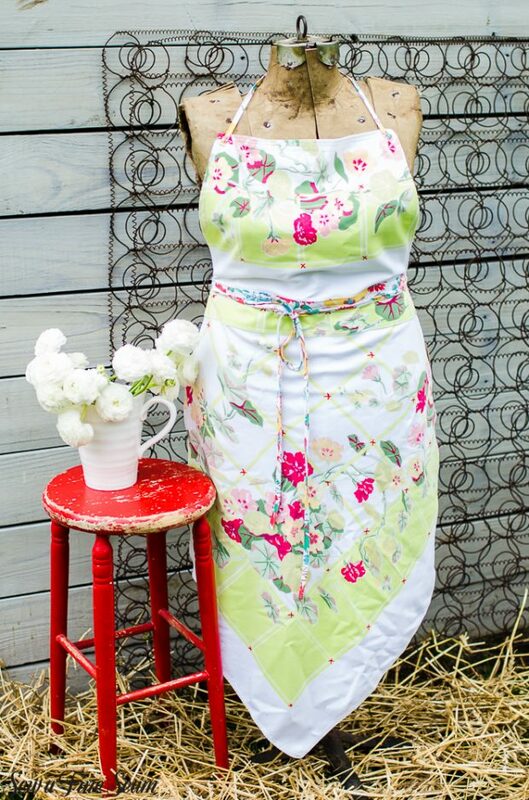 This apron features a pocket that spans the whole width of the apron skirt and is then divided up into a few sections. 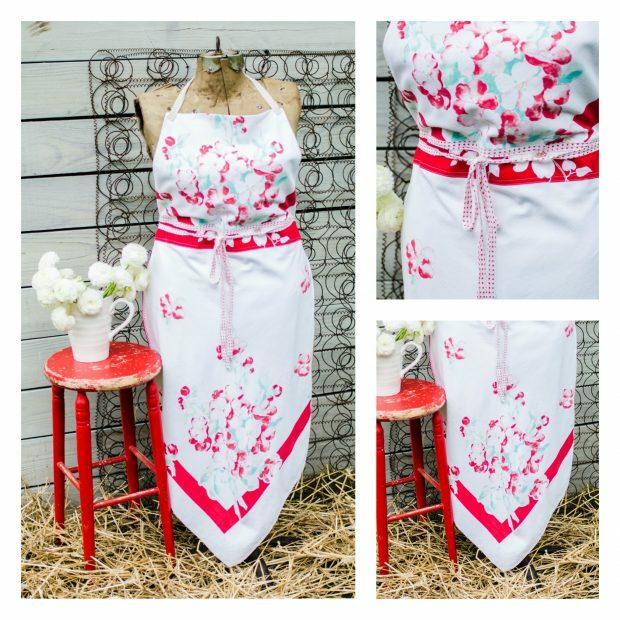 I just couldn’t bring myself to cut the point off of some of the aprons so I designed these with the corner of the apron as the skirt and left the point intact. 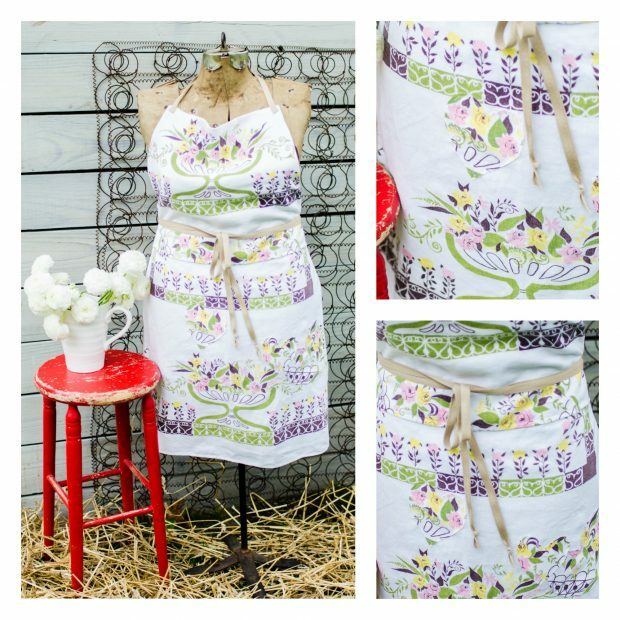 This apron and the first one shown here are both made from the first vintage tablecloth I ever purchased. Years and years ago! 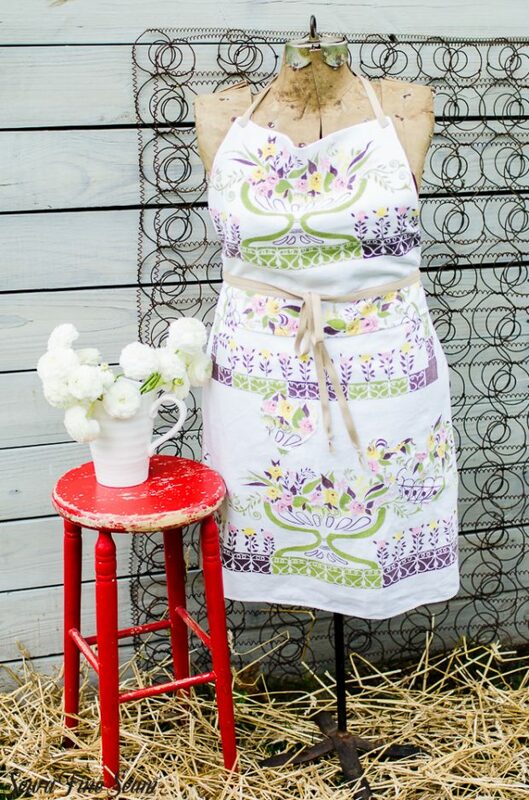 I loved that tablecloth and used it different times over the years as a tablecloth as it was intended. Eventually it ended up in my pile of things I didn’t want to get rid of but rarely used. Then it ended up at the shop for sale for awhile. But then I brought it back home because I just couldn’t part with it. I had a bit of a struggle cutting it up but I decided that since I never used it as a tablecloth anymore it really needed to be repurposed and have a new life. I think I’ll be keeping one of them for myself. 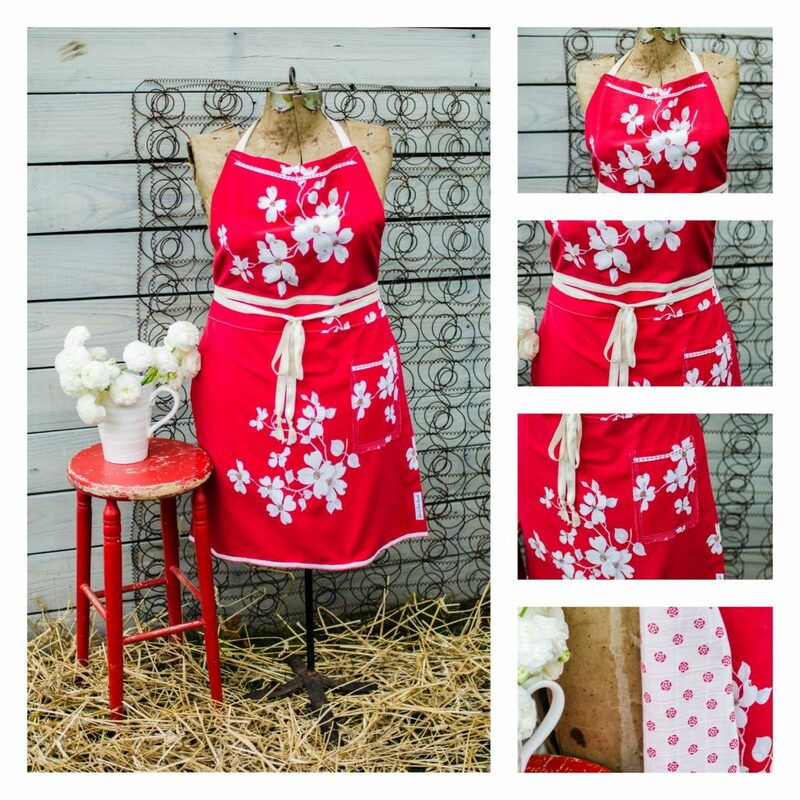 The wind was blowing when I was taking the photos of my aprons and I thought they looked cute blowing in the breeze. The neck strings tie so a custom fit can be created. 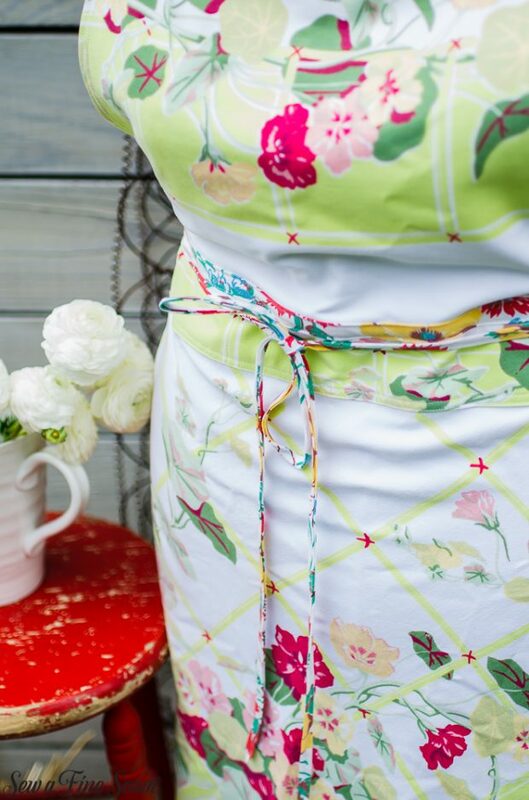 I like my apron strings to tie in the front – therefore I made the waist strings long enough to wrap back to the front and tie. They can be tied in the back if preferred. 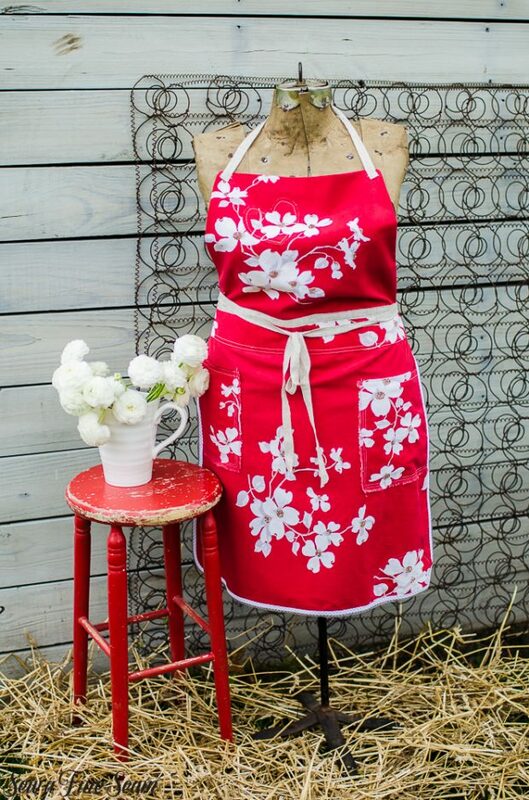 White dogwood blooms on a red background. 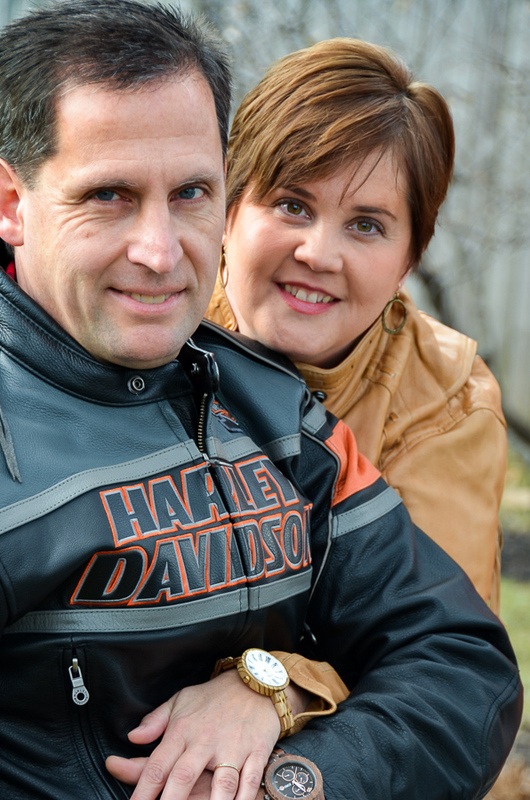 A reminder of Christ’s death so we could LIVE! 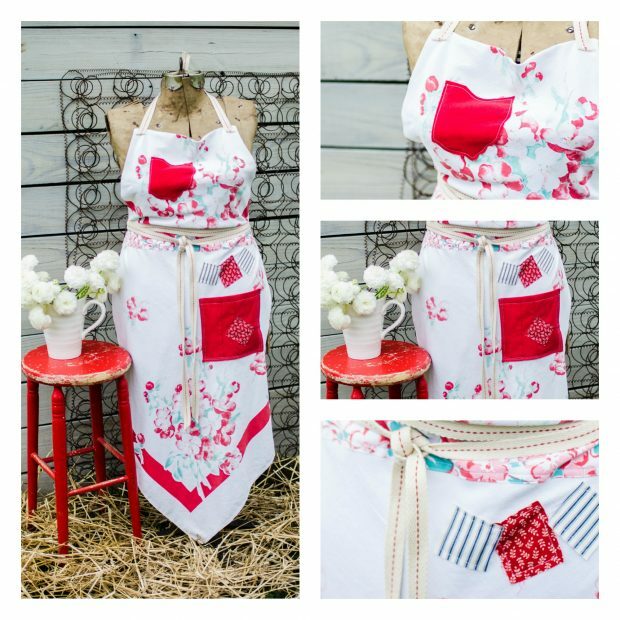 Jill, I love these aprons! 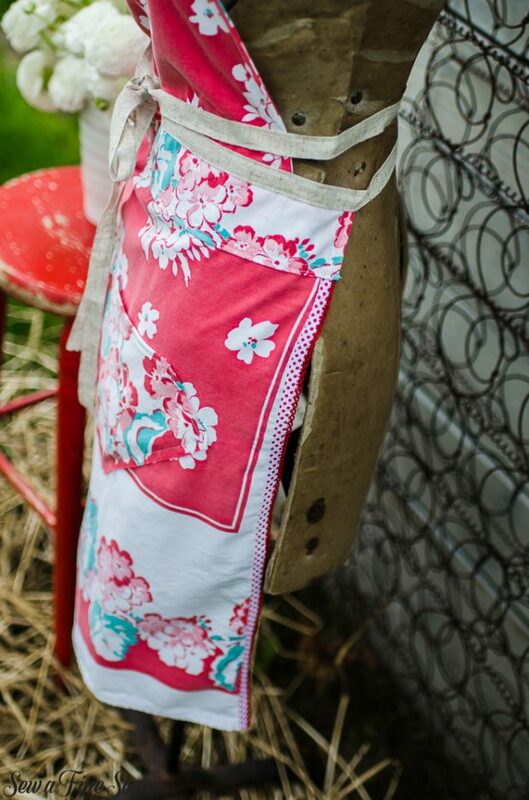 Adorable and a great way to repurpose old tablecloths! Thank you Pam! I love how they are turning out! Love! 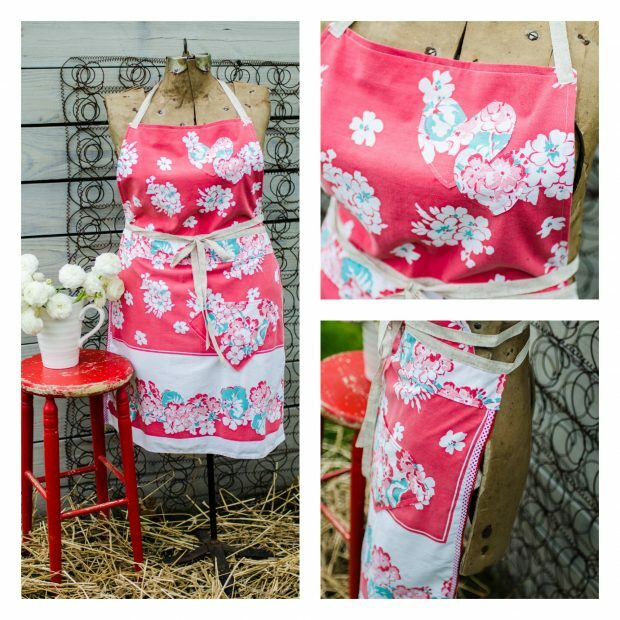 Where can aprons be purchased? They are for sale this weekend at a sale I’m having locally. I’m in Covington, Ohio. I will also be taking them to my pop-up shop events this year. 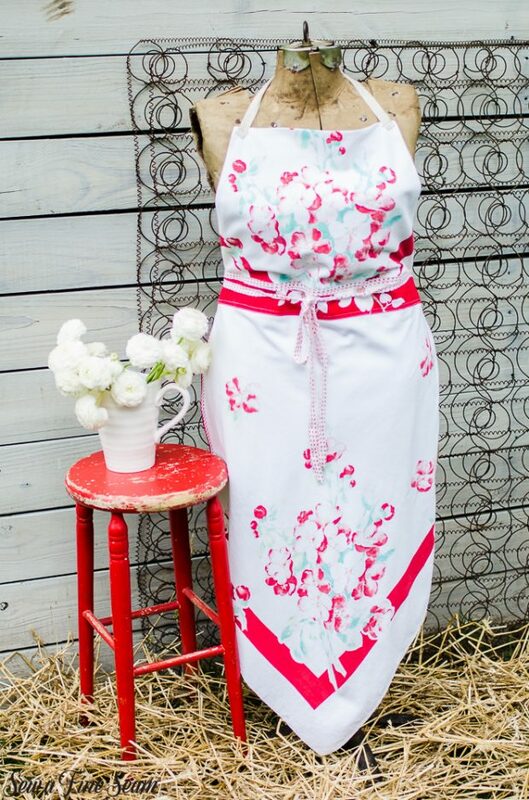 I will be doing Charm at the Farm in Lebanon Ohio the first weekend of June, The Summer Market in Avon Lake Oh the last weekend in July and some others Aug-Nov. but I dont’ know the exact date off the top of my head! 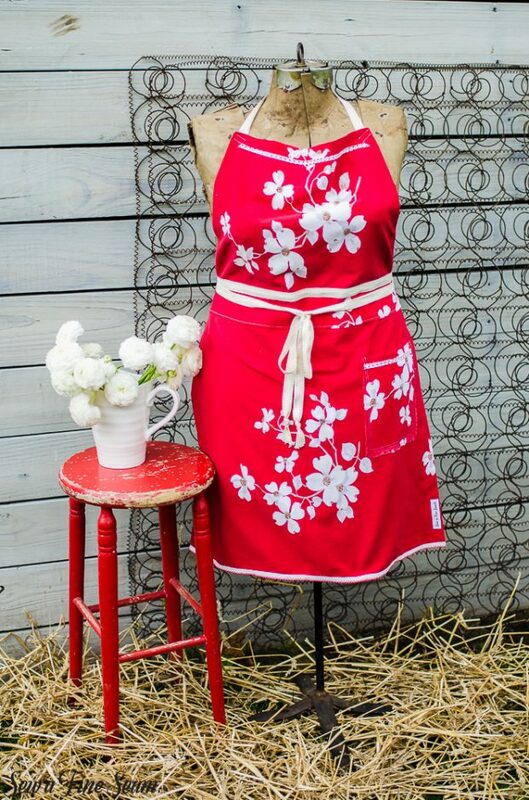 I think I have one of those tablecloths! 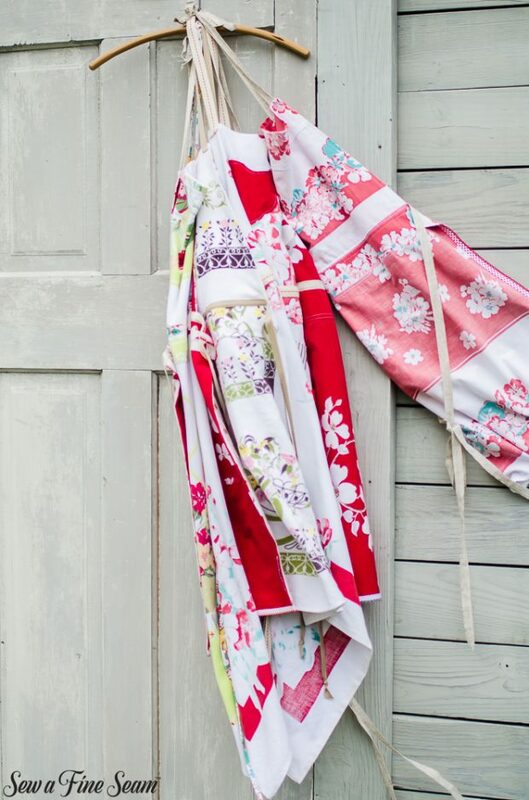 Old tablecloths are so much fun! 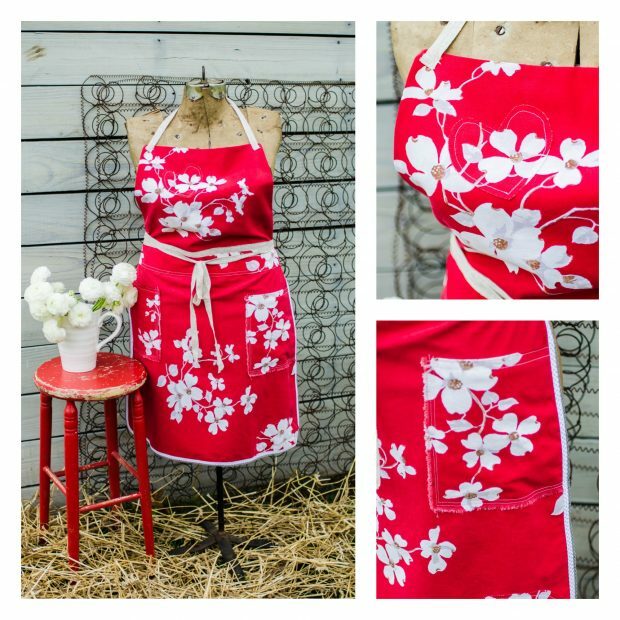 I have a new stack to make more aprons! Wow! All the experts in one place. How exciting to get all the tips from the experts.The helpful tips continue to improve my knowledge and skills in the various projects I attempt.These are so creative! Love them!